2.URL and Filename of web pages. The next step in setting up a website is to take care of the URL or filename of your web pages. 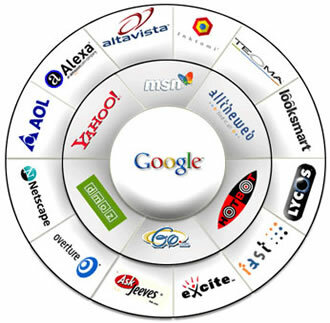 Search Engine crawlers cannot go into your dynamic websites. What I mean by dynamic websites is that you must have seen that there is a question mark (?) and and sign (&) used in the urls. This is a bad thing if you see with respect to crawlers. For instance, here is an example of the dynamic page url. or so many other ways, but just keeping in mind that there is no ? or & in it. Now you see with the title of the page you are almost representing all your product line. Many people ask me why is this important? 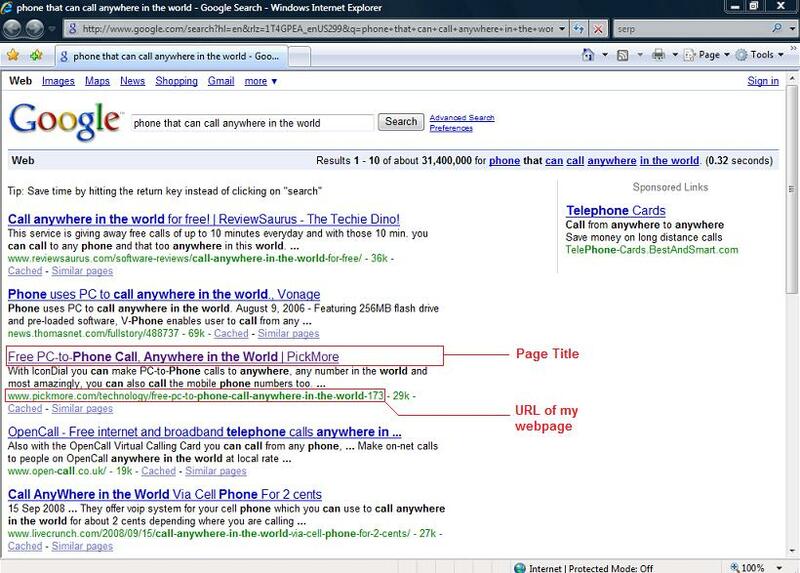 It is important because search engines see the title of the page and display the title of the page in the search engine result pages (SERPs). Oh you must be noticing that why I wrote New York USA in the title. This technique is called Geo localization of your website. As earlier mentioned that SEO is all about how others will search your website, so put yourself as a searcher and think. You live in New York, USA and you want to see the Australian woolen handmade carpets in new york. 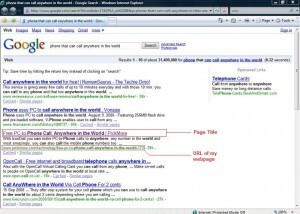 What will you search in the search engine? See! Now you got my point. Secondly your page title MUST NOT exceed 70 characters, as the SERP only shows 70 characters in the title of your website. 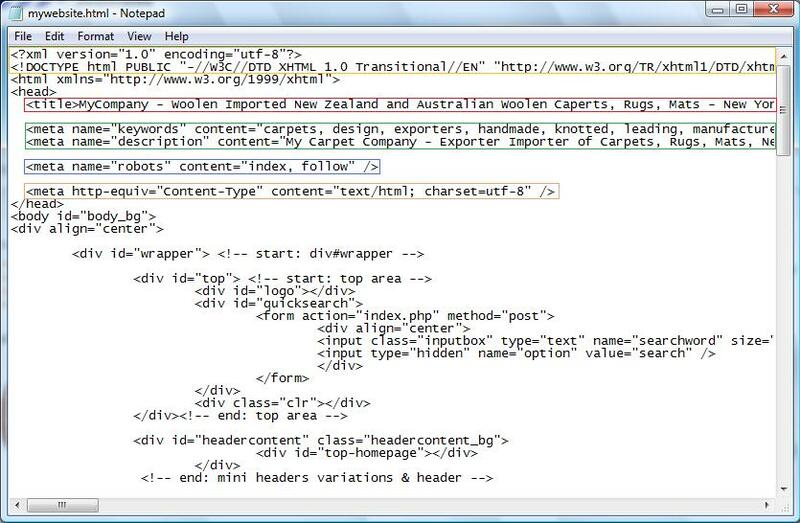 Meta tags are some source code lines which you can find in the head part of your website page. I want you to have a very good look at this above image and see the header section of the source code. I have marked every relevant tag with separate color. Red Marked – is the title of the page. Green Marked – are the keywords and description meta tags, I’ll discuss about it here. Blue Marked – is another meta tag. With this meta tag we let the search engine crawler to know that what should it crawl. So in the current screenshot I allowed the search engine crawler to crawl all my web pages and follow all the links on my website. 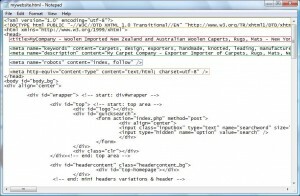 Brown Marked – is the meta tag to let the browsers and crawlers know that what text encoding i am using in this html document. Description and Keyword meta tags are quite a debatable. Some say that Keywords meta tag is necessary some say they are not. Well what I personally see is that keywords meta tag technology WAS used years ago. After Google came into action, they changed a lot of techniques in searching algorithms. But still, in some cases and some search engines it is seen that they are either totally dependent on keywords or they have a mixture of the website content, title, URL and meta tags. So I prefer, that one must use meta tags as there is no harm in using them. This blow image shows what this title tag do! So you see it actually creates this pop up tag when you mouse over any link. That’s all for now folks! I hope you all will follow these little techniques while building up a website and will get a really good search engine optimized result of your websites in the search engines. The above mentioned 5 SEO Tips for Web Designers, Developers and Bloggers are the basic and necessary actions to be considered while designing or making a website or a blog. Your website must validate the W3 standards so that Google crawler is able to see a clean and tidy code of your website or blog. The ALT and TITLE tags of HTML makes it possible for the crawlers to identify the images and links for Image searches.